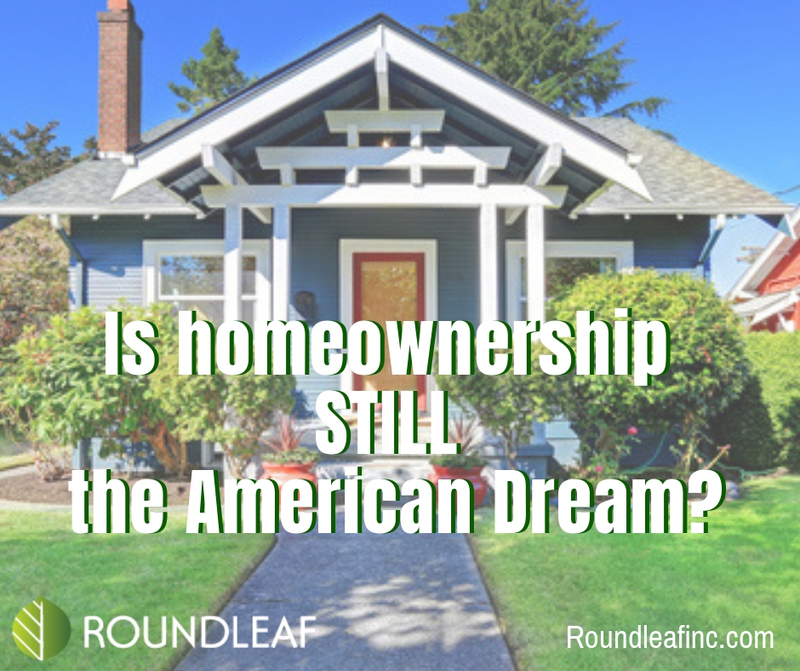 Is homeownership still the American Dream? When our parents and grandparents were growing up, this formula for a secure, comfortable, and happy life was simple: go to school, get a good job, get married, buy a house, pay off your mortgage (and raise your kids), and retire comfortably. In fact, since the end World War II, when millions of GIs came home and populated the newly formed “suburbs,” starting families and utilizing progressive new bank and government financing initiatives that made it easier to buy their first house, owning your own home has been intertwined with the very fabric of U.S. society. It’s all proven lucrative for homeowners, as real estate prices have gone up every single decade in the U.S. (over any 10-year span) since 1940. However, we’re facing a puzzling situation in our current economy, as homeownership has taken a bit of a back seat over recent years. Our current homeownership rates (just north of 6.4%) are actually near the lowest in 30 years (the 50-year average for homeownership is 65.3%). But, it’s getting harder to find compelling reasons for our failure to buy instead of rent. For instance, the economy is thriving, banks are lending vigorously with little or even no money down, interest rates are still favorable, and rising rents are making it a less appealing option to keep paying your landlord every month with nothing to show for it over the years. There may be several good reasons for our national reluctance to get our own keys and move in: a lingering hangover from the last real estate bust and Great Recession, a lack of affordable starter homes in most major markets, a tightening of the purse strings as the cost of living rises, and, especially for the Millennial demographic, student loan debt that is thwarting their ability to buy. However, if there’s anything we’ve learned with real estate is that this, too, shall pass. Even as economists and analysts warn of recessionary storm clouds on the horizon once again, and home sales volume has dropped across the country, reports of the housing market’s demise may have been greatly exaggerated. For instance, this time, any economic slowdown won’t be caused by the real estate market nor irresponsible mortgage lending practices. Instead, the real estate sector – which constitutes about 1% of our total GDP all told – will serve as a steadying force amid volatility Wall Street and imploding debt bubbles. You can use other people’s money (a bank loan) to obtain a larger asset with only investing a fraction (3.5% or even less!) of the purchase price. But when the home goes up in value, you benefit from appreciation on the total asset. Owning a home is also rife with tax benefits. In fact, owning your own home and especially paying your own mortgage are some of the most lucrative tax breaks Uncle Sam will ever grant you – just ask your CPA or tax planner! You also have control over where you buy and what kind of home, choosing the neighborhood, school system, and individual property, while you can’t do that with stocks or other investments. Furthermore, you can actually roll up your sleeves and increase the value of your home just by making improvements – called sweat equity. Try doing that with a mutual fund or bond! As we mentioned, the alternative of renting comes at a high opportunity cost, as you’re essentially lining your landlord’s pockets or paying his or her mortgage every month, but with absolutely nothing to show for it once you move out. With homeownership, however, you benefit when the price goes up, accruing equity that can be tapped into with a loan or accessed when you sell. What if the price goes down, you ask? As long as you have a stable fixed-rate mortgage loan, you won’t experience any detriment at all the next month, and you can simply wait until the market comes back and you gain equity again. In fact, the Federal Reserve estimates that the average homeowner is “sitting on” $80,000 of equity. Homes with at least 20% equity are up 21% since before the last recession, and 48% of U.S. houses have at least 50% equity! The average homeowner has $7,300 in savings or liquid assets, while the net savings rate for non-homeowners is zero (or even negative!) in the U.S. Statistics also prove this point by the fact that the net worth of the average homeowner is 34 times higher than that of the average renter – an astounding gap in wealth! Will housing prices go up over the next 5-year period? 94% of them responded that yes, home prices would rise over the next five years. And only 4% thought that home prices would drop slightly over that time. In total, that’s more than 9.5 out of every 10 economists who believe that the housing market is still healthy and on the rise, despite concerns about the overall economy – a near consensus that it’s wise to buy a home now! It’s no wonder why surveys show that 81% of renters would rather buy a home if they could! 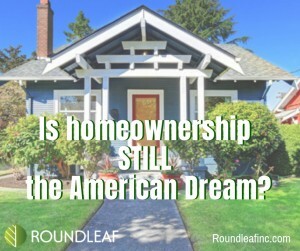 Those are just a few of the reasons why buying a home is STILL the American Dream, throughout 2019 and far beyond – and Roundleaf can help you achieve that dream by freeing you up from debt, making your budget look right side up again, building credit scores, and putting you on the path to home ownership.